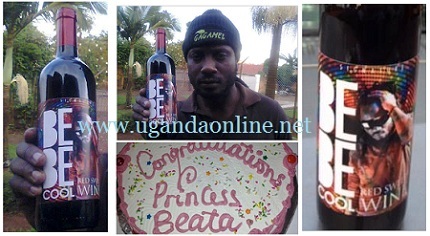 Distributors of imported wines and manufacturers of local wines have got another brand to add to their stock after Bebe Cool joined the local wine market with his Bebe Cool Red Sweet Wine brand. Details of where its being made from and when it will be officially launched are still scanty but all we know is that this particular brand is Red Sweet Wine. Like all alcoholic drinks, wine should be consumed moderately to avoid headaches like the one Bebe Cool is going through on his wine bottle. Bebe Cool joins the likes of Bella Wine in the Uganda Wine making industry and distributors like the Muyenga based Wine Garage will be more than happy to address fans of Gagamel as and when they demand for Bebe Cool Wine. This comes at the time when his wife Zuena has made a name for herself in baking cakes. The timing is just right now that its the festive season, Bebe Cool is likely to make some money. One Gagamel fan was over heard saying that: "Its a Gagamel ting dis. We are going to play Bebe Cool's X-mas music, eat cakes from Zuena pastries and take it down with Bebe Cool Wine.